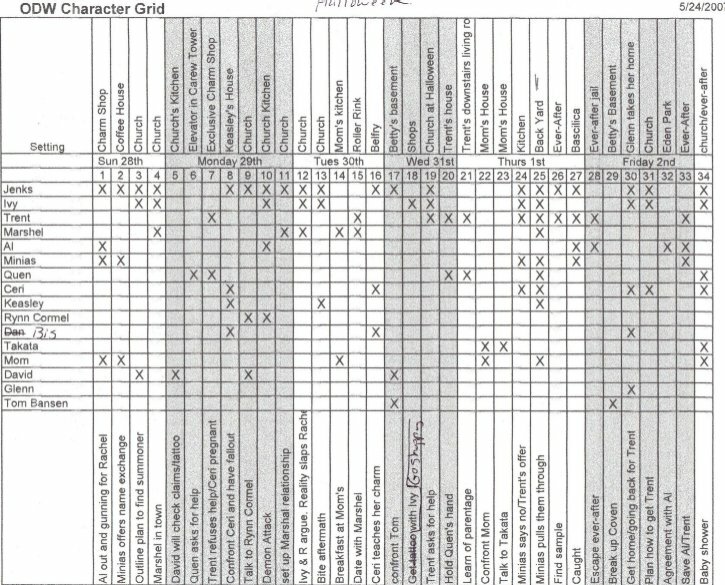 Today I want to talk about another way of using Excel to outline your novel: The Character Grid. 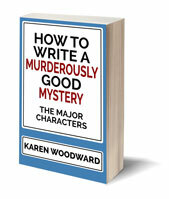 This method comes from Kim Harrison, author of the Hollows Series. Let's dive right in. Yesterday I rewrote my plot to take out the demon plotline and expand two others of crime and love. It made a much more tidy story and I was able to dig deeper into the relationships instead of skimming over them. My one page synopsis turned into a 13 page synopsis, casually broken into maybe-chapters. Today I’m going to begin to break this up into clear chapters so I can better balance the entire work as to pacing, place, and characters. I don’t want to spend too much time in the church, or be moving from place to place in any given chapter. My rule is no more than one scene shift per chapter, and try not to stay in any one place for more than two consecutive chapters. Same thing with characters. 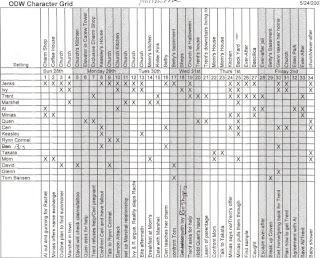 My character grid is how I first realized that Jenks was in almost every chapter in the earlier books, and I’ve become better at getting him out so other characters can shine. It’s also how I know if I have a character who is needed for a crucial scene, and yet is not introduced anywhere until that scene. Very bad. Same thing with the bad guys. I try to have them show up early, and then at least one more time before the end. Another rule of thumb is don’t introduce too many characters in the same scene, even if they are returning characters. I like to have only two at the most, and will break a chapter just to avoid this. Kim Harrison's post is one of the best I've read on plotting and structuring your work-in-progress and it's part of a series. 1. Where you at in NaNoWriMo? "Today, in my official Not-NaNoWriMo, I have again procrastinated with other work, confining my rough draft of book ten to ideas in my head. Tomorrow, I will pick up my pencil and write something down. Promise. How about you? Where you at?" That’s what it’s all about at this point for me. What do I want to see or accomplish in this 500 page monster. So today I’ll be sitting down with about ten sheets of paper and a pencil." "My word count is still zero, but I’m almost ready to start writing. My post yesterday gave you some indication of how I went about organizing my thoughts for a new book. Well today, I’m going to tell you exactly what I did." "Well . . . I took my six pages of notes from Thursday and wrote up a free-flowing, one-sentence brainstorming list of “ways to start” and a list of ”ways to end.” I still don’t have a good way to start the book, and I won’t until I have the end, but my goal is to have in the first five pages the hint of the problem that is settled in the last so to make a full circle." "For those of you who haven’t been to the drama box in a few days, I’m taking the opportunity of NaNoWriMo and me just starting rough draft to detail out my plotting process. Disclaimer:everyone writes differently, there’s no wrong way to do it. This is what I’ve come up with over the last ten years or so, and what works for me. It’s a process that’s still evolving. Oh, and my word count is still zero." 6. And on the fifth day . . .
"So far, while using my character grid, I’ve found that I’ve got a slow spot, and I moved some things around to quicken it up. I also named a new character, learned a few things about him, and Rachel has told me she likes him better than the guy I thought she’d be interested in. He kind of likes her, too, or maybe he just likes the way she makes him feel. (Be smart, Rachel.) I’ve also learned what the story is about besides solving the crime and settling the love interest. (By the way, it’s not settled.) What I’m talking about here is the character growth, I suppose. And without character growth, not only would the story be stale, but I’d be bored to tears writing it." "... again. (grin) Last night, I finished breaking my 13 page synopsis into chapters, using it as a guide to write about a page of handwritten notes about each chapter, being careful to include who is in it, where to begin, and what poignant thought to end it with. It’s here that I usually find my hook into the next chapter that gets you to turn the page instead of turn off the light and go to bed." "Yesterday I finally finished my plotting and started actually writing the thing. Taking my one page of notes on chapter one, I spent the morning writing out the dialog, then in the afternoon, I turned it into prose. Today I’ll take my one page of notes on chapter two and do the same, and in about three to four months, I’ll have turned my 27 pages of notes into a 500 page manuscript." 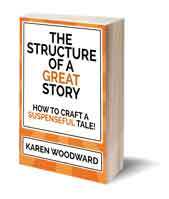 How do you plot your novel? Does it look anything like Kim Harrison's method? Thanks for reading! 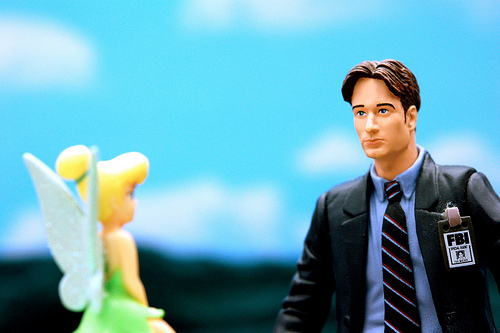 Photo credit: "I Want To Believe … In Fairies" by JD Hancock under Creative Commons Attribution 2.0.